West Brom enjoyed their first league win in six games to ease their relegation fears but deepen Newcastle's worries at the bottom of the table. Both teams hit the crossbar, with Paul Dummett's header ricocheting off the woodwork for Newcastle and Victor Anichebe going close for the hosts. Just as a draw seemed inevitable, Darren Fletcher timed his run perfectly to head home Claudio Yacob's cross. But it was poor goalkeeping as Karl Darlow should have done better. Darlow will look back on his Premier League debut with mixed emotions. He was a late inclusion in Steve McClaren's line up as regular goalkeeper Rob Elliot was withdrawn before kick-off because of illness. The 25-year-old, whose only previous appearance for the Magpies was in the Capital One Cup against Northampton, was uncertain under the high ball throughout and should have held on to Fletcher's header, rather than allowing it to slip through his hands with 12 minutes remaining. It will leave United fans wondering whether their team, who remain in the bottom three, two points adrift of safety, would have earned a point had someone of Elliot's experience been on the pitch. Ironically, Darlow's best contribution came after conceding, acrobatically diving towards his near post to stop substitute Saido Berahino's goal-bound effort. Baggies boss Tony Pulis had warned of a "concertina" effect after two successive defeats against two of the teams below them - Bournemouth and Swansea - but the alarm bells will have dimmed a little after this hard-earned win which moves them six points off the relegation zone. Despite his team dominating possession and looking the stronger side in the second half, it looked as if the Baggies' poor home form would continue - they had only earned eight points at The Hawthorns prior to this match - until Fletcher struck for his 20th league goal. Scoring has been a problem for Pulis' men of late, but Victor Anichebe - making his first start of the season - added ballast to West Brom's forward line and was a nuisance and a reliable outlet. His performance was only missing a goal, the crossbar preventing him from heading home from a corner. In the first half, Dummett also blocked Anichebe's powerful effort and the industrious striker received a deserved ovation from the home fans as he hobbled off injured before full-time. Newcastle boss Steve McClaren said it had been a tough three days for his team, who have now endured two narrow defeats over the Christmas period. But the Magpies' spirit did not appear to be damaged by the Boxing Day defeat which saw Everton score with the last kick of the ball. McClaren's men courageously defended against West Brom's direct approach (the Baggies had 17 corners and 22 shots on goal), with Fabricio Coloccini particularly impressive. The ubiquitous Newcastle captain cleared James Morrison's effort off the line in the opening minutes and had an improvised backheel - after Dummett's header had struck the crossbar - saved by Boaz Myhill. McClaren said his team should have had a second-half penalty when the score was goalless and the evidence supports his claim, as Jonny Evans appeared to grab Aleksandar Mitrovic around the midriff as the striker aimed to shoot from six yards. Victor Anichebe may not have scored but his presence up front caused Newcastle problems and his ability to hold the ball gave West Brom's midfielders time to surge forward. On that form, Baggies fans will hope his injury is not too serious. West Brom manager Tony Pulis: "We deserved the victory. It was a good, open game. The first 10 minutes we could have been 3-0 up, they defended stoutly but thank goodness the dam did burst in the end. "They were dangerous on the counter and we had to defend the set-plays well, but I don't think there's any argument that we should have won the game. The disappointing thing again is that we should have scored more goals. "Victor Anichebe on his day is unplayable. He's got everything you'd want from a centre forward." Newcastle boss Steve McClaren: "We've had a tough three days and I feel so sorry for the lads. After so much effort and attitude, to stand toe to toe with West Brom, dealing with all the crosses and the balls in the box, I thought we did ever so well. "But the game hinged on two things. It was a certain penalty. It's unbelievable. It doesn't help us, it's cost us the chance to get the first goal, which is all-important in this kind of game. "We're all unhappy with the goal we conceded. We coped with everything and I don't think Darren Fletcher will say it was a bullet header but that's football. Decisions at each end have cost us but we'll battle on." This was only the third time in 29 league games that Newcastle had failed to score against West Brom. The Magpies have failed to score in 10 of their last 15 Premier League away games. WBA had 22 shots, which is 12% of their entire total in the Premier League this season. West Brom's 22 shots are seven more than they have managed in any other Premier League game this season. Newcastle managed only one shot on target in each half. WBA kept their first clean sheet since October 24 (vs Norwich), ending a run of eight without one. West Brom will be glad of ending their winless run before hosting in-form Stoke on 2 January and travelling to Stamford Bridge to face fellow strugglers Chelsea on 13 January. Meanwhile, Newcastle's Premier League fixture list does not get any easier as their next two league opponents are Arsenal (away on 2 January) and Manchester United (home on 12 January). Match ends, West Bromwich Albion 1, Newcastle United 0. Second Half ends, West Bromwich Albion 1, Newcastle United 0. Corner, West Bromwich Albion. Conceded by Chancel Mbemba. Attempt blocked. 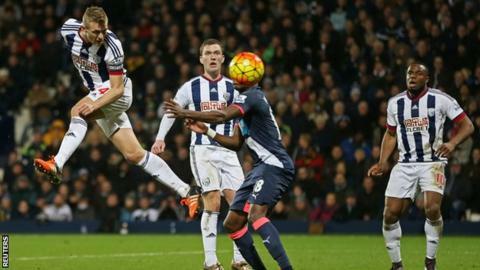 Craig Dawson (West Bromwich Albion) header from the left side of the six yard box is blocked. Assisted by Stéphane Sessegnon with a cross. Substitution, West Bromwich Albion. Rickie Lambert replaces Victor Anichebe because of an injury. Delay in match Victor Anichebe (West Bromwich Albion) because of an injury. Corner, West Bromwich Albion. Conceded by Karl Darlow. Attempt saved. Saido Berahino (West Bromwich Albion) left footed shot from the left side of the box is saved in the top left corner. Assisted by Stéphane Sessegnon. Substitution, Newcastle United. Florian Thauvin replaces Jack Colback. Saido Berahino (West Bromwich Albion) wins a free kick on the right wing. Attempt saved. Victor Anichebe (West Bromwich Albion) left footed shot from the centre of the box is saved in the bottom left corner. Assisted by Jonny Evans with a through ball. Goal! West Bromwich Albion 1, Newcastle United 0. Darren Fletcher (West Bromwich Albion) header from the centre of the box to the bottom right corner. Assisted by Claudio Yacob with a cross. Attempt blocked. Saido Berahino (West Bromwich Albion) left footed shot from the right side of the box is blocked. Assisted by Stéphane Sessegnon. Corner, West Bromwich Albion. Conceded by Paul Dummett. Attempt blocked. Jonny Evans (West Bromwich Albion) left footed shot from very close range is blocked. Attempt blocked. Jonny Evans (West Bromwich Albion) right footed shot from very close range is blocked. Victor Anichebe (West Bromwich Albion) hits the bar with a header from very close range. Assisted by Stéphane Sessegnon with a cross following a corner. Offside, West Bromwich Albion. Boaz Myhill tries a through ball, but Victor Anichebe is caught offside. Substitution, Newcastle United. Siem de Jong replaces Ayoze Pérez. Substitution, West Bromwich Albion. Saido Berahino replaces James Morrison. Delay in match Paul Dummett (Newcastle United) because of an injury. Victor Anichebe (West Bromwich Albion) wins a free kick in the attacking half. Attempt saved. Aleksandar Mitrovic (Newcastle United) right footed shot from the right side of the box is saved in the centre of the goal. Assisted by Ayoze Pérez.